Gus Kenworthy of United States competes in the team challenge slopestyle jibs competition Sunday, Dec. 17, at Breckenridge Ski Resort. Hunter Hess of United States is greeted by his friends at following the team challenge superpipe competition Sunday, Dec. 17, at Breckenridge Ski Resort. Evan McEachran of Canada comes to a halt following the ski slopestyle team challenge run Sunday, Dec. 17, during the Dew Tour event at Breckenridge Ski Resort. 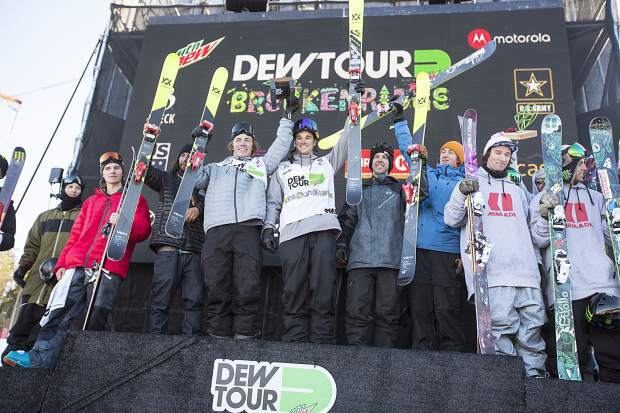 Team Volkl placed first in the team challenge Sunday, Dec. 17, during the Dew Tour event at Breckenridge Ski Resort. 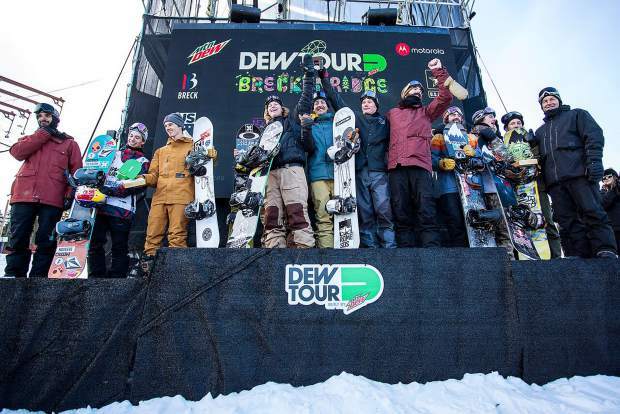 Snowboard Team Challenge at the podium during the Dew Tour event Sunday, Dec. 17, at Breckenridge Ski Resort. Gus Kenworthy’s week at Dew Tour was over, until it wasn’t. 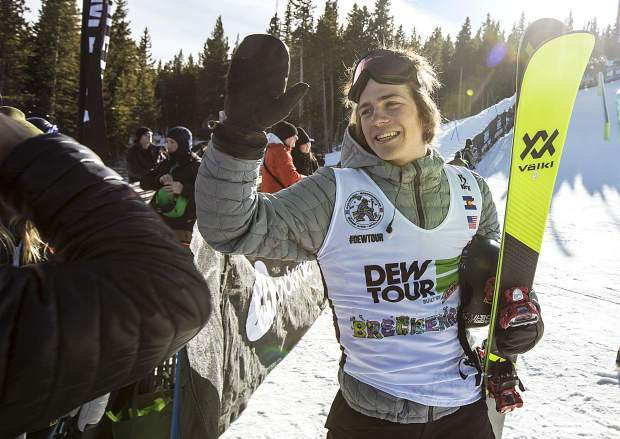 The 26-year-old freeskier from Telluride competed in the Dew Tour Team Challenge slopestyle jibs event for team Atomic and pieced together a 91.66 on his first run. It propelled Atomic into second place in the Team Ski competition after the superpipe and jibs portions of the competition. Within striking distance, just five points behind Team Volkl (169.66), Atomic’s Nick Keefer of Salt Lake City dropped in to take on the Dew Tour Slopestyle course’s final two jumps. 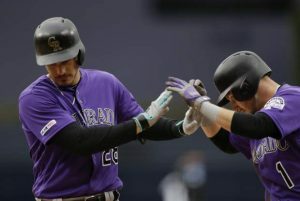 But on a windy afternoon at Breckenridge Ski Resort, Keefer fell hard in-between the first and the second jumps, suffering an apparent head injury, as Kenworthy said his teammate was initially knocked out due to the fall. Standing at the top of the slopestyle course, Kenworthy and Atomic teammate and halfpipe competitor Miguel Porteus skied down to check on their teammate. 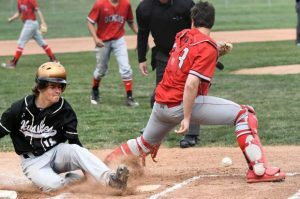 “He was talking and everything which was reassuring because it’s always hard to see someone fall,” Kenworthy said. “It’s scary. 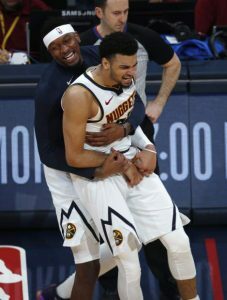 But he was responsive and moving, and that was all good, and they were boarding him up for precautionary sake. 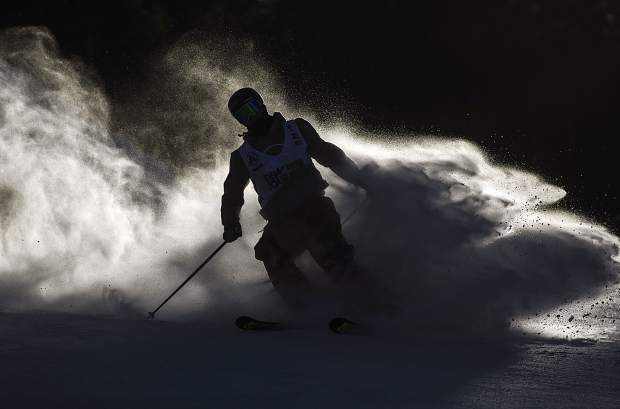 So Kenworthy skied back to the top of the course and asked his fellow competitors what the speed of the course was like, as he hadn’t practiced at all on the jumps on Sunday. Then, he went for it. 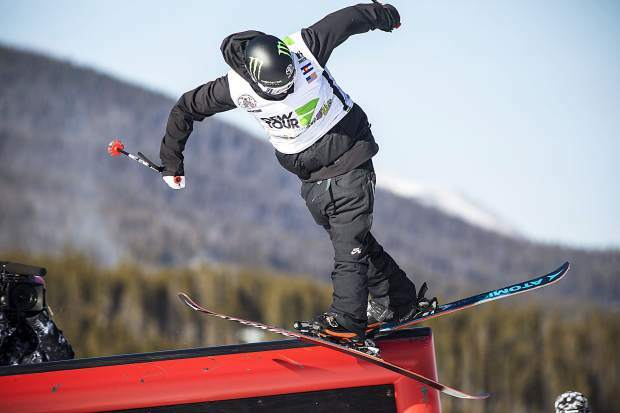 Kenworthy’s jump was the final trick executed to cap a long and jampacked week of Dew Tour individual competitions from Wednesday through Saturday and Sunday’s team snowboard and ski competitions, all in Breckenridge. Kenworthy’s 83.66 on that last run propelled Atomic to third place in the ski jumps competition, behind second place and happy-go-lucky Swede Henrik Harlaut for team Armada (87.00) and first place American Nick Goepper for team Volkl (88.66). Those scores combined with the team ski superpipe and jibs scores meant Kenworthy also bumped Atomic up to third place overall, with a 248.32 points. Kenworthy earned the lionsshare, as he accounted for 175.32 of those points. The other skier who also took to both the jibs and jumps courses, Goepper, accounted for 179.66 of team Volkl’s 258.32 points. That mark was more than seven points better than the 251.00 posted by Armada, led by the second place showing by Harlaut in ski jumps. Goepper’s hand in Volkl’s victory meant a lot to Goepper after the team took second place in this same competition at Dew Tour last year. 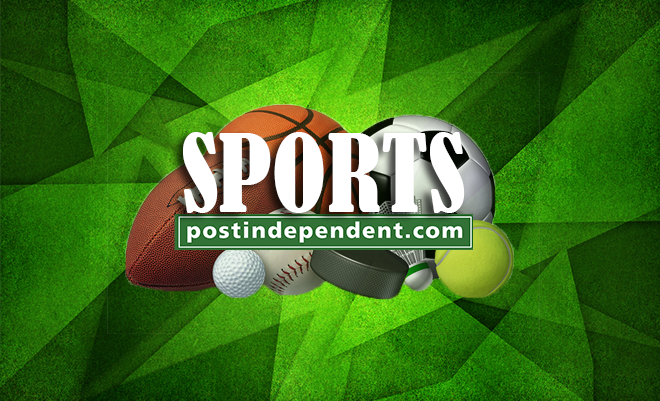 The ski veteran and 2014 Sochi Olympic slopestyle bronze medalist Goepper also shouted out his Volkl teammate Hunter Hess, a 19-year-old halfpipe skier from Bend, Oregon, who took first in the ski superpipe portion with a 78.66 run. That tally bested team Head’s Aaron Blunck (76.00, second place) and team Armada’s Torin Yater-Wallace of Basalt (third place, 74.00). It was a back-and-forth battle between snowboard brands Sunday morning, before team Rome secured victory with a 264.65 out of possible 300 points, barely topping team Burton’s 262.00. Rome got a headstart on its competition when Rene Rinnekangas of Finland posted the highest score on the halfpipe, an 86.66. That mark was more than three points better than second place Danny Davis of Burton. 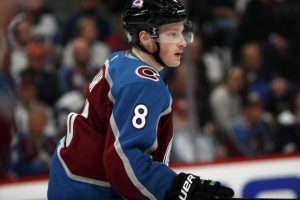 It was then over to snowboard slopestyle jibs, where 17-year-old Red Gerard of Silverthorne repped Burton and strung together an 87.00 on his first run, a mark that was strong enough to hold on for first place. The strong showing also pulled Burton essentially tied with Rome through the first two events, down 0.99 points 170.99 to 170. Rome’s Ozzy Henning — who won Friday’s Streetstyle competition — took third in the jibs (84.33). Then it was Norway’s Stale Sandbech who secured the victory for Rome, posting a 93.00 on his first run and an even better 93.66 on his second run to fend off Mark McMorri’s second run 92.00 for Burton.